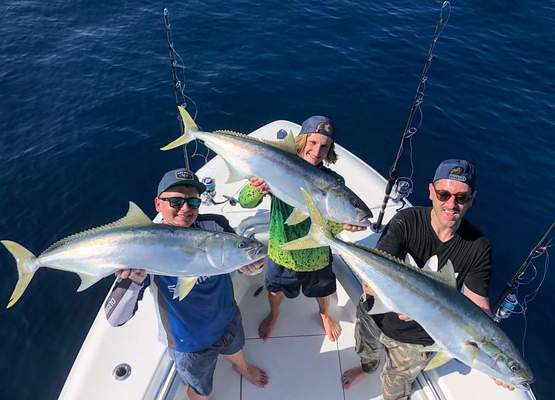 KINGS FOR A DAY: Peri Stavropoulos and his mates with kingfish in New South Wales. Corio Bay’s grammar school lagoon was made a good fishing option considering the past week’s treacherous weather. Offering some protection from the wind, the lagoon fished well for species including big winter snapper, flathead and bream. Fishing the bay’s inner-harbour, particularly land-based, continued to produce bag-limit captures of garfish at all the usual spots like boat ramps and small jetties. Bream made appearances again as well. The Bellarine Peninsula had good numbers of squid present and willing to attack jigs when conditions allowed boats to head out. Queenscliff Harbour remained a favourite location for soft plastic anglers chasing silver trevally. Fishing either a high or low tide was preferred, with anglers also packing squid jigs as another option within the harbour. Down west, the fishing around Warrnambool was on fire. Both the Merri and Hopkins rivers fished fantastically for big brown trout. Both rivers are exempt from the trout closed season and offer trophy fish right through winter. Bigger, shallow-diving lures around 80mm to 100mm are proven winners on these trout. Anglers shouldn’t be discouraged by dirty water and cast into the top of pools, rapids and any bit of moving water where the fish will be lying awaiting an easy feed. Anglers who made the drive to Nelson to fish the Glenelg River for mulloway were rewarded with good numbers of big fish. Mulloway over the 60cm minimum limit were common with some were well over 1m. Live mullet fished on the bottom was productive as well as dead baits like pilchard and squid. The bream fishing was also good and easily accessible for anglers without boats. Using prawns and worms produced bream from the boat ramp and along the bank near the kiosk. On the freshwater front, Lake Bolac remained a hot spot for big rainbow trout. Using Powerbait or Gulp salmon eggs in orange or yellow was a standout method of targeting fish potentially reaching 3kg. Trelly’s Geelong’s Peri Stavropoulos headed to Kingscliff, New South Wales, with mates Fez and Josh. Fishing aboard Unleashed Sportfishing with Jason Hedges, they caught around 30 kingfish to 15kg and two amberjack around 30kg.